The last SLEX was in 2011 discontinued because of lack of financial support. 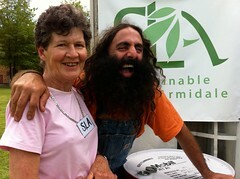 The Sustainable Living EXpo started 2007 and is held every year. SLEX initially developed from a number of community events into an integrated flagship event for Armidale and the wider New England region. As a response to the growth of climate change as an issue for local government, business and the community SLEX aims to provide attendees with the information, inspiration and tools to transitions towards more sustainable ways of living and doing business.